Prive, the restaurant I’m enamored of, was fully booked so I had to settle for Dozo, which serves Japanese-French fusion food because I heard good things about it. When we walked in, a grumpy woman who looks like a bulldog–this is said in an objective, non-bitchy way–dashed in front of us, and we let her go first. It took three servers to wait on her; which is fine because I’m patient. Love the private room. Very quiet and lovely. The colors (mauve and beige) and the material (lace) gives the room the feel of a boudoir belonging to a French courtesan. But Jolynn said, “Look at the decor. It isn’t even a first-rate restaurant’s decor.” I think the decor is fine, perhaps she means the material used. The table is of a rough quality and has no cloth on it. But perhaps the restaurant is going for a Japanese feel, wood, no cloth. The trouble with having a private room is that we had to leave the room to call for service. The restaurant should have installed a bell in the room. We had their seven-course dinner, which is kind of a cheat because their last course is a drink. On the other hand, the menu is extensive. In each of the seven categories (Starter, Cold Dish, Side DIsh, Soup, Main, Dessert and Drinks), there are 5 choices. On the other hand of the other hand, I thought the restaurant could reduce the choices and work on their specialities. Because there were so many choices, the waiters had to explain and recommend some to us. WS hates to be instructed or explained to because he knows so much and in explaining, he thinks that the servers (waiters and salespeople) are very condescending, as if he were a plebeian. He and the rest of them think that the servers were too informal and not polished enough, although I quite like that kind of service. It puts me at ease. I prefer it to the uppish waiters at Iggy’s. Before the starter, we had two surprises. Instead of bread, we had pastry sticks, decorated as twigs, to munch on. Very Mr. Bean who serves twigs as licorice at his Christmas Party. Because my friends were late, I said to them as I chewed on a twig, “You guys are so late, I’m so hungry I have to eat twigs.” Everyone looked contrite; nobody laughed at my bad joke, which is the only kind of jokes worth telling. The other surprise is a free drink made of plum and passionfruit juice to, in the words of the waiter, “clear the palate.” When my friends said that the drink was made of syrup, I had to verify with WS because I trust him with food and alcohol. Him, Jolynn and Shenn. How can a restaurant such as this serve syrup drinks?! The amuse-bouche (no more bad but amusing jokes about what amuse-bouche is) is actually different from other restaurants: it is actually expensive: smoked salmon, scallop and foie gras. The waiter suggested we start with the blandest (scallop) to the strongest (salmon). Naturally, WS had to go the other way round. At this time, my sister discovered a tiny cockroach on her plate! It was quite hilarious, she was trying to guide the insect to remain on her plate while we called and waited for the manager. During the wait, much talk were said about how we deserved a full meal, all 7 of us, but I think my friends didn’t want to kick a fuss because it was my day. Side Dish. WS ordered the bamboo clam. I had the outrageously displayed soft shelled crab. Look at it! It is so funny. “Help! Help! I’m stuck in mashed potato.” Too bad, nom nom nom. This crab was bad, tasteless, not crispy and didn’t go well with mash. But the vegetable tempura redeemed it slightly. Soup. Among the seven of us, I was the only one who ordered the mushroom truffle soup. Best mushroom soup I have had in my life – but what can go wrong with truffle and mushroom soup. Jolynn ordered the beef tenderloin; my sis and XH ordered the unagi and I had the Kurubuta pork cheek. It would have knocked me over–being so soft and tender and tasty–had it been warm. The last part of the meal came like a flash, like the last meal at a Chinese wedding, always hurried because it was near closing time. So there wasn’t any photos. I had warm chocolate cake. My sister complained that the chocolate didn’t ooze out but I like it that way, neater. And I like it that the chocolate is bitter, as bitter as my emo heart. Kidding. The Apple drink I had at the end of dinner was extremely refreshing. WS bought this as a birthday present. I don’t usually like champagne because I think it’s just overhyped sparkling white wine and they usually taste bitter, as bitter as my emo heart! 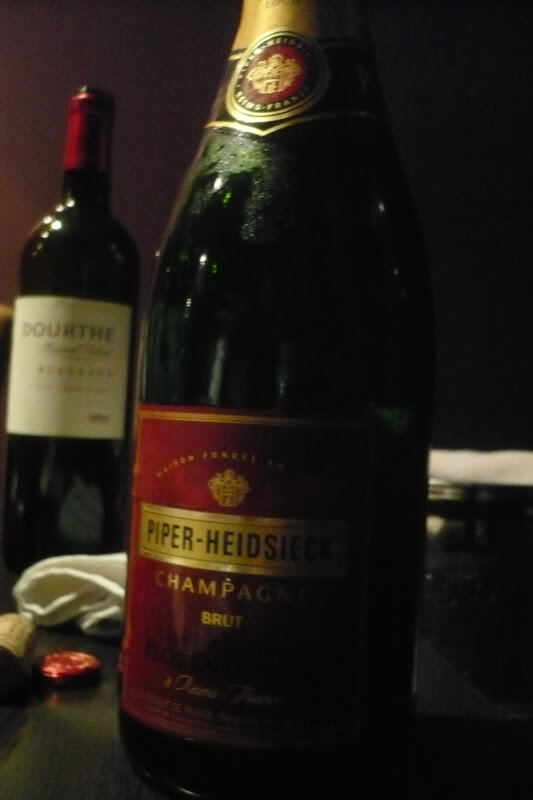 But this has to be the most delicious champagne I have drunk. Very easy on the palate. My picky friends gave the restaurant–including the food, ambience and service–two stars, based on the price they had to pay. But actually, it isn’t all that expensive, about $75 for a 7-course meal including taxes. And I think it is also because I ordered different dishes from the rest of them and I was lucky that my dishes turned out to be quite delicious, except for the amuse-bouche and soft shelled crab. I also don’t mind the ah-beng, amicable service. Plus the private room was quiet.